1965: Tony learns to swim before he learns how to walk. He has great success as a competitive swimmer from ages 4-10. 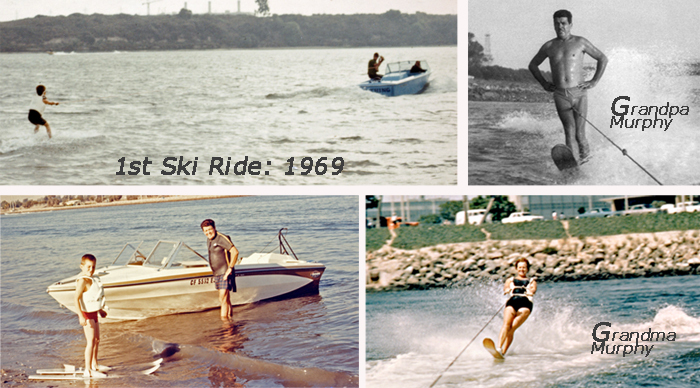 1969: At age 5 Tony learns to ski on the Carlsbad Lagoon near San Diego, CA. “Little” Tony skis mainly with his grandparents, Nick and Mary Murphy. 1970s: The young and impressionable Tony is heavily influenced by his uncle, Mike Murphy. Mike is world renowned as a show skier, speed skier, and is establishing himself as the “Father of Hot Dog Slalom Skiing”, and co-inventor of the kneeboard. 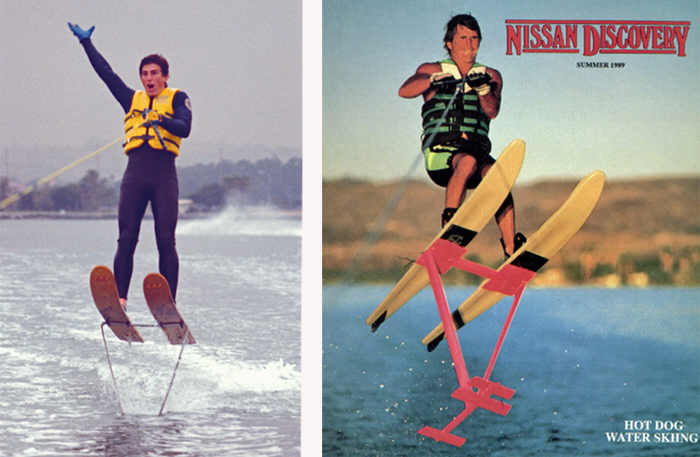 1970s -1980s: Stand-up hydrofoils become a favorite ride for Tony and uncle Mike. 1980-1982: “Little Tony” goes to work for Mike at his ski school on the Parker Strip of the Colorado River. In his three summers with uncle Mike, Tony acts as shop grunt, salesman, boat driver, instructor, and show ski performer. In the summer of 1982 Klarich has his breakthrough year on the slalom ski, inventing 3 new moves. 1983-86: Klarich gets a job as a professional show skier at he Six Flags Magic Mountain ski show in Valencia, CA just outside of Los Angeles. This Magic Mountain Ski Show highlights video includes one of Klarich’s best barefoot runs with a perfect stage landing. 1983-84: Klarich get his first paid ski sponsorship with O’Brien. He holds his own in a promotional video shoot with Camille Duvall, Andy Mapple, and many other top riders of the day. Klarich was the original kneeboarder promoting the Black Magic. 1984: After years of training and hundred of attempts, Tony becomes the first skier to perform front flips on a slalom ski. He is immediately given a salaried contract by Herb O’Brien to represent his new line of skis: HO. 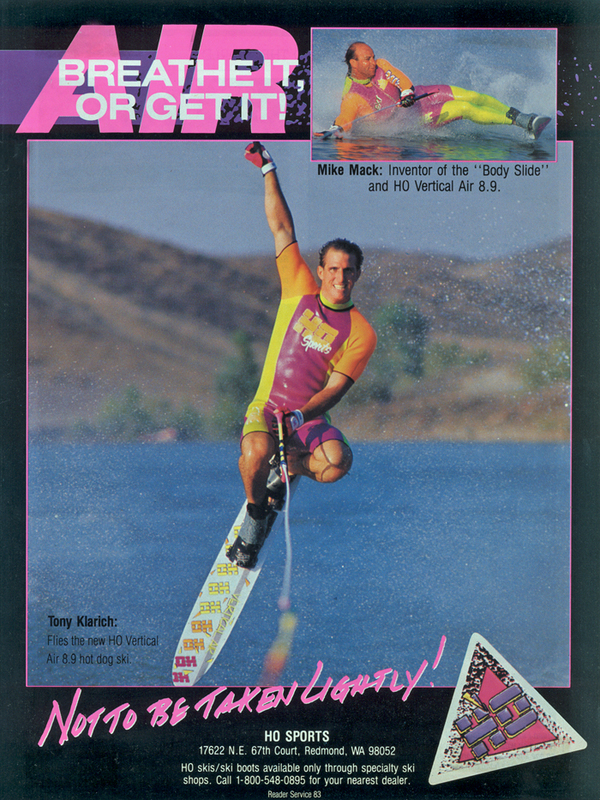 1985: Klarich makes a splash in the watersports media with numerous features and articles. He joins forces with Danny Churchill and Hydroslide as one of the nation’s top kneeboarders. 1985: Klarich does the first of several TV commercials and joins the Screen Actors Guild. 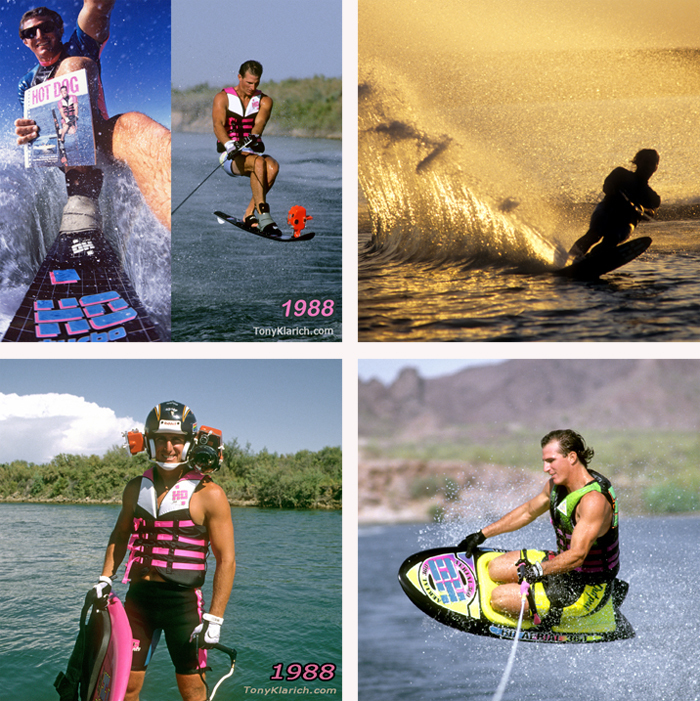 1985: Klarich wins the first of 3 national overall kneeboarding titles in the top men’s division of the AKA Nationals (1985, 1986, 1989). Along the way he sets numerous nationals records in tricks and slalom. 1986: Uncle Mike, Mike Mack, and Tony hop a plane from the Hotdoggers’ Hangout on the Parker Strip of the Colorado River to Orlando Florida. They join Deena Brush, Cory Pickos, and the Larson Twins to shoot HO Sports first promotional video. 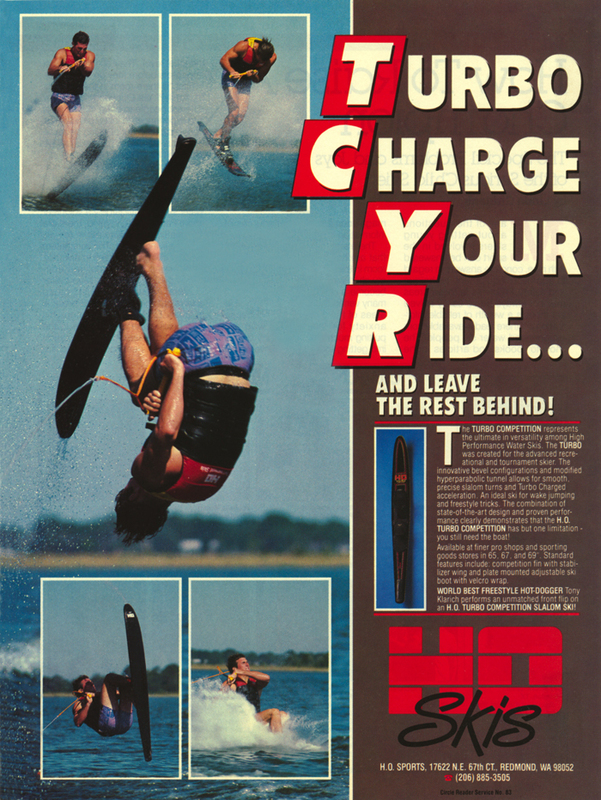 1986: Tony designs HO’s first kneeboard, the Aerial 360. 1986-1989: Klarich becomes an integral part of HO Sports promotions. 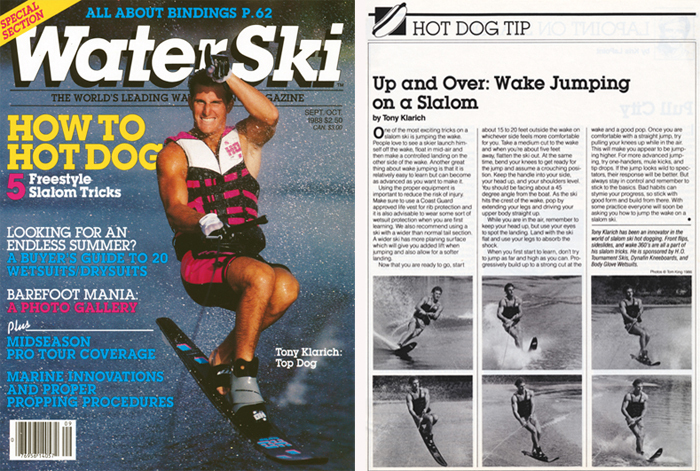 1986-1990: Hot Dog slalom skiing catches the attention of water skiers everywhere, and Klarich writes numerous instructional tips. 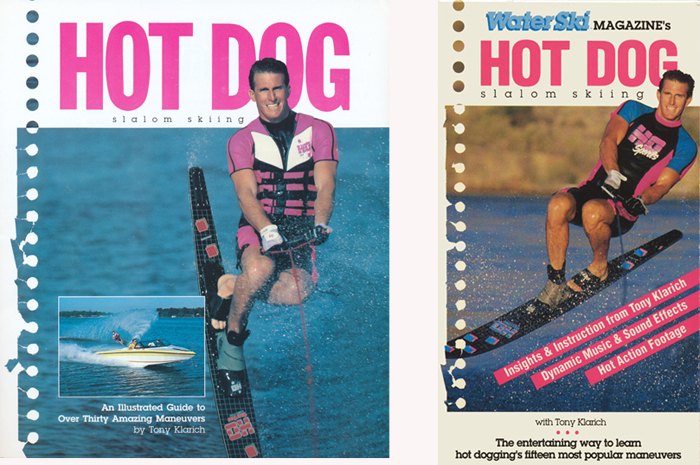 1988: Water Ski Magazine develops a book and video featuring Hot Dog Slalom Skiing. 1987-1993 Klarich hires surf photographer Rick Doyle. The shoots are expensive, but Klarich now retains rights to his own photos. Along the way the pair develop some of the earliest use of remote water-cam pictures in water skiing. 1990 After years of performing as an exhibition act at the Water Ski Pro Tour, Klarich is chosen as the principal performer of the Michelob Dry Don’t Boat and Drink commercial. Stock footage from the Hot Dog instructional video appears in one of the most colorful commercial in water skiing. 1990: Hot dog slalom skiing is at its peak of popularity in large part to Klarich’s unrelenting appearances and promotions. HO Sports releases a ski designed by Mike Mack specifically for hot dogging.